Nearly thirty of us crunch softly up the gravel path between scarlet, rose, snowy white, and purple rhododendrons, the still-low sun nudging leaden clouds in the eastern sky. We follow retired forester Tom Mickel as he shoulders his spotting scope toward the main lawn of Hendricks Park Rhododendron Garden. Searching for the black-headed grosbeak burbling its exuberant song, we gaze upward into the oak canopy just in time to watch a crow float down from its mossy perch. Sleek, crested cedar waxwings flock from tree to tree and then down to devour green fruits among the bronzy new growth of an eight-foot Mahonia ‘charity,’ an exotic relative of Oregon grape. Later, most of us had still not spotted the grosbeak, but all binoculars turned skyward to see a snoozing raccoon draped over a fir branch some thirty feet up in the tree. It was a Sunday in May, and we were on one of maybe a dozen annual tours in Eugene’s Hendricks Park, this one through the Rhododendron Garden and then into the woodland, looking for birds. 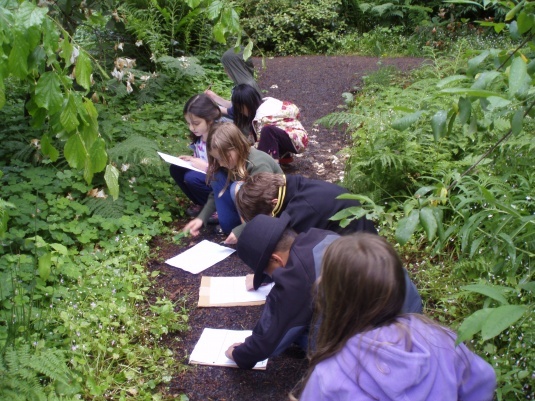 Other tours on subjects such as ethnobotany, wildlife habitats, mushrooms, or exotic plant identification and history follow any of several paths through seventy-eight acres of urban forest and native plant and rhododendron gardens. Hirst put us to work removing the noxious weeds herb Robert and nipplewort from a bed beside Summit Drive, smother-mulching the dreaded celandine (it’s impossible to weed out with all those rice-grain-size tubers falling off), planting rhododendrons, or rescuing from the horsetail and potting the pretty ground cover, false lily-of-the-valley. Friends of Hendricks Park Board member Jim Beyer looked up from the nipplewort in amazement. Fourteen people working three hours is more than one full-time worker working for a week. And every Tuesday morning from March through November, volunteers tackle similar tasks throughout the park. The volunteers and the tours both are projects of the Friends of Hendricks Park, which formally incorporated as a nonprofit in December 2001. In the late 1990s, concerned about the health of forest trees, a group of park neighbors noted that the 100-year-old park had no master plan or long-term management goals. The Eugene City Council responded, hiring a consultant and appointing an advisory committee of neighbors, scientists, and city staff members to develop a forest management plan. In January of 2000, after months of committee input and a multitude of surveys, research, and evaluation by consultants, a two-volume forest management plan described park history, natural resource inventory, use, and forest health, as well as vision, goals, and strategies for the future. The plan encouraged using the forest as a living laboratory and building a native plant garden as an outdoor classroom. Together, forest and garden should give students from elementary school through college and beyond a place for environmental education and research. It noted that “demands on staff exceed abilities to maintain a healthy urban forest,” but also that the community strongly supports natural areas and their protection and management. Fairmount neighbors Joan Kelley and David Moon hosted a group to discuss ways to support the plan. At about the same time, Jerry Blakely was looking for a spot to endow a native garden in honor of his wife, Mary ’78, who had recently died of cancer. Blakely and the neighborhood group found each other and Friends of Hendricks Park was born, with Blakely as its first president. Almost immediately, the Friends began building the native garden, supporting forest restoration, planning education partnerships, and providing volunteer support and fundraising for the many projects recommended in the forest plan. I lived with my family in the morning shadow of Hendricks Hill for twenty-five years, walking and running in the park, walking dogs in the forest, bringing guests to visit the beautiful gardens. But it wasn’t until the mid-to-late 1990s, forty years after I moved to Eugene, that I became intimately acquainted with the park. Beginning at age sixty, I became a city employee and spent the next two years as the third member of the three-person Hendricks Park gardening crew, which was irregularly supplemented by community service people, at-risk youth, or master gardening students. We had visitors from Japan, Germany, Sweden, New Zealand, and Holland; third-generation rhododendron growers from England and Scotland; famous gardeners from around the United States and Canada and the Czech Republic. Every time a big track meet was held at Hayward Field, a parade of elite athletes would come through the park as the first stop on their pilgrimage to Pre’s Rock, a memorial to the late Steve Prefontaine ’73, just north of the park. So this is a world-famous place, its gorgeous old rhododendrons mixing with thousands of other plants, bringing bloom to the garden throughout the year. Beds surround a main lawn and interweave among gnarly Oregon white oaks, framing a network of paths. The lawn, with oak-branch shadows filigreed across virescent grass, often finds tai chi practitioners greeting the day or bidding it farewell. When the sun shines, blankets sprout across the lawn, beneath young mothers with babies or starry-eyed couples with picnic baskets of local-baked bread, chunks of cheese, and bottles of wine. When the late-day sun is just right for photography, young women appear in wedding gowns, prom dresses, or graduation regalia, posing for pictures framed by flowers. Generations of locals have wandered the paths, admired the gardens, explored the forest, lounged to enjoy the stars or each other. And generations of runners young and old—joggers, high school and University athletes, elite postgraduates, masters—have trained on Hendricks’ forest paths. Neighbors think of the park as an extension of their own backyards, and at the same time as a respite from life’s hectic pace. Friends’ member Linda Sage says, “When I step into the forest, I step into a different, stress-free world.” And where else, so close to town, might you see, as Sage’s husband Martin did, a raccoon chasing a wild turkey around the garden? So important to so many, but with a regular staff of just three, could we do justice either to the park or to the people? 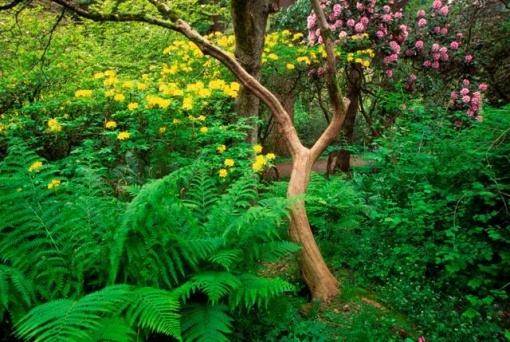 It was a challenge merely to keep up with the weeds in the thirteen-acre Rhododendron Garden, much less to manage the remaining sixty-five acres. But we loved the park. We were there on site each day; we knew each path and bed; we could respond when hikers and joggers brought us news of problems in the forest. Then the voters approved a tax-limiting measure, and the city began preparing pink slips. We assumed that as I had been a recent hire, I would be among the first to go. I sadly took retirement, as many others throughout the city were laid off or positions were left unfilled. That was about fourteen years ago, and the city coffers appear unlikely to overflow any time soon. In the current recession, rather than having three full-time staff members with Hendricks Park as their home base, the public works department assigns roving crews to several parks. The crew that comes to Hendricks works at six or more other parks, coming to Hendricks as little as twice a week. The lawn gets mown; the trash gets picked up; but daily presence is no more, and the continuing connection to the park is primarily through the Friends. Eugene had its first park. The Rhododendron Garden was the brainchild of the Eugene Men’s Camellia and Rhododendron Society, an organization begun in 1944 specifically without “rules, minutes, amendments, or women.” Two of the wives, Ray James and Ruth Lyons, however, were among the best and most prolific rhododendron breeders, and it was from Ms. James’s 1945–51 correspondences with C. P. Raffill of England’s Kew Gardens that the group gained not only a wealth of information on rhododendron culture, but also thousands of seeds and cuttings from choice species and hybrids. In 1951, the men’s group received permission from the Eugene Parks Department to create a garden, with plant donations from the members. All ardent gardeners, few of them owned enough land to expand their collections as they’d like. Elk and deer in a small zoo at the top of Hendricks Park had cleared a large area of brush, presenting a seductive blank canvas for a grand garden. Camellias were the number-one love of most of the men, but two of them, Del James and A. F. Barnett, were passionate about rhododendrons. After the first bad winter killed nearly all of the 6,000 newly planted camellias in the nascent public garden, members turned to James and Barnett for information and advice, and the garden’s focus shifted to rhododendrons. The society was inspired by and learned from the collection of James Barto, at his farm near Junction City, the largest and best rhododendron collection in the United States during the 1930s. Many of Barto’s plants, or cuttings or hybrids from them, found their way into the Rhododendron Garden, and with contributions from England and Asia and the continued generosity of the Rhododendron Society (which in 1955 officially admitted women), the garden attained world fame. 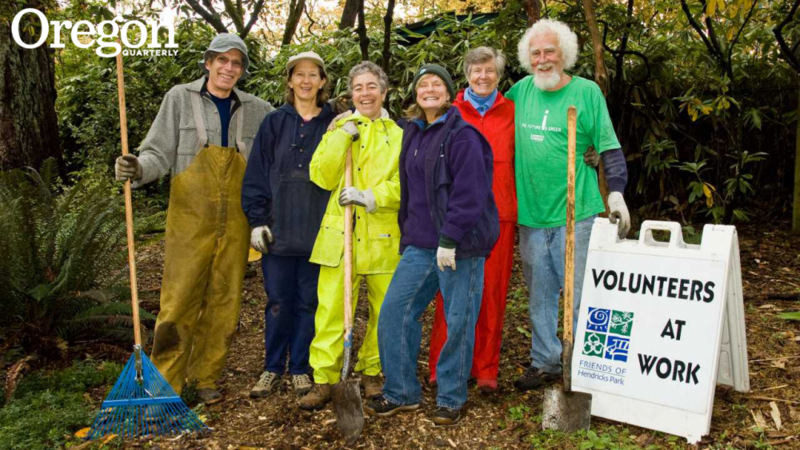 Since the Friends were formed about ten years ago, groups of volunteers have logged nearly 30,000 hours, and members have contributed tens of thousands of dollars. They continue their essential work in the Rhododendron Garden; they built the Mary Blakely Native Plant Garden and a semicircular terrace (the “moon terrace”) adjacent to it; they assure maintenance for the native garden (Blakely’s bequest included a trust fund for ten hours of weekly maintenance to be matched by the city); they provide half of Hirst’s eight-hour-per-week salary, the other half coming from the city, for coordinating the Tuesday morning work parties; and they work in the forest, as well as providing funds to support additional work there. of the park, a remnant of a once-dominant Willamette Valley ecosystem. Now extremely rare, this forest type provides habitat for plants and animals not found in other forest communities. 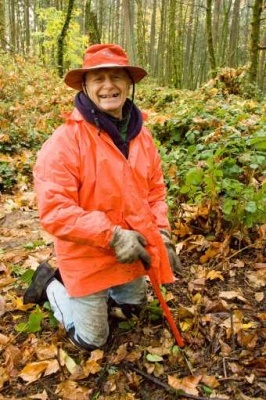 When the Hendricks Park Forest Management Plan was adopted in 2000, the city hired a part-time coordinator for work in the forest. Under the coordinator’s supervision, the Friends group, along with UO environmental studies students, sororities, fraternities, and youth and business groups, have worked toward eliminating invasive plants, replanting appropriate plants, and installing paths to access the oak woodland, dubbed the Oak Knoll. The most recent economic downturn threatened the forest coordinator position, but after the Board of the Friends of Hendricks Park testified that years of past work and money would be lost without the coordinator—not to mention the hundreds of future volunteer hours and the experience and research benefits to students—the Eugene Parks and Open Spaces Department agreed to maintain the 7.5-hour-per-week position for another year. The board continues to chart endless hours planning, organizing and promoting projects, fundraising, and advocating for the park. Linda Sage praised Friends’ founders Joan Kelly, David Moon, and Sandra and Fred Austin for making the vision of the Forest Management Plan a reality. The Friends continue the legacy of Thomas and Martha Hendricks and the 1950s Rhododendron Society, of private people sharing for the public good. Certainly the city will always care about its parks, but budgets and priorities remain unpredictable. As new generations get to know the park through tours, education programs, University research, and hands-on park work, we can only hope that they too, like the Friends, will want to give back—to care about and care for Eugene’s first park. Evelyn Searle Hess ’66, MS ’86, is the author of To the Woods: Sinking Roots, Living Lightly, and Finding True Home (Oregon State University Press, 2010). For more information about the Friends of Hendricks Park, visit www.friendsofhendrickspark.org.